Found 10 file extension associations related to Noki and 1 file format developed specifically for use with Noki. Noki is a utility for exploring and extracting of Phone book, Text message, MMS, Calendar, Memo, Bookmark and other user files from the backup file of Nokia phone (using Nokia PC Suite). 2 steps to get the data back: open the file and extract. Extraction, conversion, exporting: all can be done in the right click menu. Preview contacts, messages, calendar, photos in the content explorer. With a complete guide for data recovery. The Noki-extracted data can be saved in text, Excel .xls, .csv or Html files which are much accessible than the original binary format (.nfc, .nfb, .nbu, .cdb or .arc). Other files extracted (3gp, image, photo, mp3, mp4 etc) will remain their original format. The Noki-exported backup file can be easily imported into other applications (which include Microsoft Outlook and Outlook Express, Mozilla Thunderbird, Microsoft Excel, OpenOffice Calc, Firefox, IE and Nokia PC Suite). .nbu, .nfb and .nfc: backup file of PC Suite (v6.5 ~ v7.1). You can smothly upgrade your PC Suite to new versions without worrying about the compatibility issue. Noki takes care of the compatiblity of the different versions. 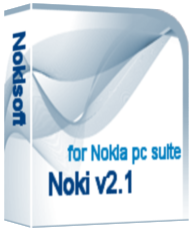 Noki developers actively participate in the Nokia PC Suite beta test process to make sure Noki works for the "future" version of PC Suite. If you need more information please contact the developers of Noki (Nokisoft), or check out their product website.